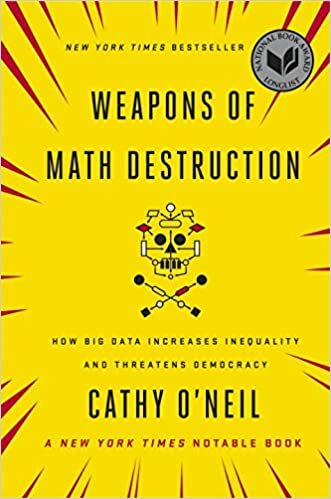 In a thought-provoking book about fundamentally flawed algorithms, Cathy O’Neil brings to light some of the many issues that surround big data analytics. This relatively new form of analytics has revolutionised our world. But is this really for the better? O’Neil delves deeper into the nature of these seemingly mysterious programs, that in today’s world control more than we think: from college rankings to predatory advertising. She unveils the way in which they can be damaging to the prospects of some, and crucially highlights how the negative feedback loops they often create only worsen the situation – a critical problem faced by the poor. Hence she names them ‘Weapons of Math Destruction’, a cynical but apt name for the tools that firms and governments often blindly rely on. As someone with a deep curiosity about how things work, I found this book incredibly enlightening. It draws on examples of individuals like you and me who have suffered at the hands of WMDs. Cathy O’Neil emphasises the colossal power that they have grown to have, and how great an impact they can have on your life. No longer are they limited to simply optimising your web searches. From biased university rankings leading to students drowning in debt and unfair teacher analysis resulting in redundancy, these seemingly innocent pieces of data-crunching software have the potential to ruin people’s lives. Cathy O’Neil opens our eyes to how our data can be used to make far-fetched judgements about our personalities, qualities and behaviour. The lack of transparency, however, means we are often unaware that this is happening. All in all, this is a very accessible book and I think it would particularly interest students with an interest in the ethics of computer science. That said, if you are curious to learn about how your data may be used, I’d absolutely recommend it to you as it is a very easy read. This sounds like a book my boyfriend would adore. I’m definitely going to let him know about it. Great review, I love seeing this side of you. Thank you so much! Hope he enjoys it! I absolutely love the title 😆 I haven’t read a book like this in a long time, might need to check it out online. It’s great isn’t it?! Hahaha, you should do if you get the chance! This sounds like it would be such an interesting book to read, I’ll have to look into it. Ooh, this sounds really interesting! Im going to order this I do love a bit of ethics especially in relation to our data, and the digital world we now live in!